Welcome to Cliff House at Canyon Lake! There's more down the hallway! Stock your favorite beverages here! Cliff House at Canyon Lake is perfectly situated and arranged to host your group of up to 10 guests. The spacious, open- concept living, kitchen, and dining areas allow you to make the most of your time spent comfortably relaxing and reuniting with friends and family members. The living room holds a large, comfortable sectional sofa and wall mounted HDTV... but your eyes will be drawn away from the screen and towards the Lakeview below, through the large- panel windows. Cliff House's kitchen is well stocked with all cooking and dining essentials. The dining table is a bonus, but when the weather is right, there's no better place to enjoy that perfect vacation meal than the spacious outdoor deck, overlooking the blue waters below. A newly built staircase allows easy access to Canyon Lake from the back yard and deck above. Back indoors, you'll find that the three spacious bedrooms and two and a half baths offer ample space and comfort for all guests. The first bedroom hosts a comfy queen bed, TV, and attached back with tiled, walk- in shower. In the second bedroom there is a queen bed with an additional twin bed as well. Lastly, the third bedroom offers a bunk setup that totals 1 full size and 3 twin beds. The half bathroom is conveniently located just outside of the bunk room.. perfectly situated for those little travelers in your group. 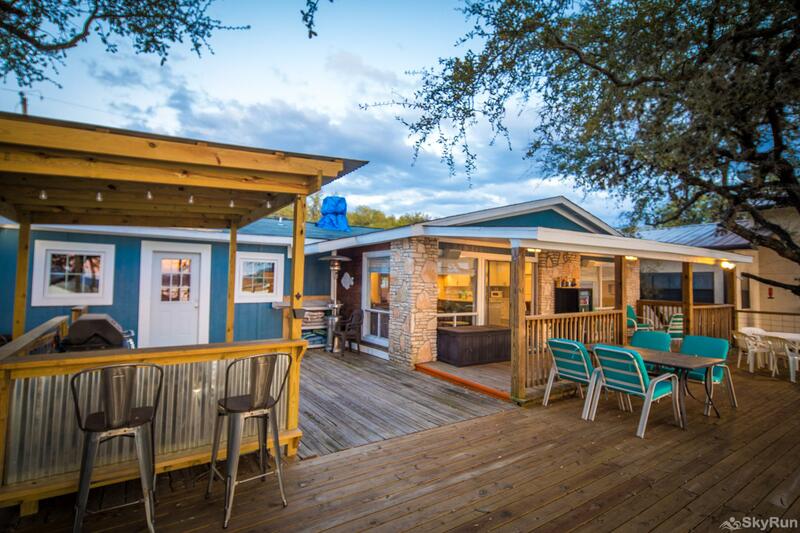 Cliff House is a standalone vacation destination, but don't forget you will also be within easy reach of area boat rentals, Canyon Lake park areas, tasty restaurants, New Braunfels and Schlitterbahn Waterpark, and much, much more! You must be 25 years or older to rent this property. Maximum occupancy at all times is 10 guests and 3 vehicles. Please come and have a good time, but be aware that behavior that is disrespectful or disruptive will result in forfeiting the remainder of your stay. No smoking or pets are allowed on the property.